When you’re given a pair of sunglasses upon entering the theatre, you know you’re in for a unique experience. In Penumbra was unlike any dance or multimedia show I’ve seen, with bright lights and lighting fixtures everywhere, seating in the round, and an otherworldly aura about the whole thing. Light bulbs were scattered around the space — on the floor, hanging from the ceiling, covering a large net hanging over one side of the stage. Through the eerie haze of lighting and cheap sunglasses, we looked around the stage and at the other audience members across from us, not sure what to expect. A dancer began to descend from the sound booth, throwing her shoes down ahead of her. Four more dancers followed, exploring their new world as if they had just arrived on a new planet. The piece is said to be inspired by a search for utopia, so perhaps that would explain the searching and disorientation. Vibrations grew louder and the space was filled with eerie static noises seemingly caused by the abundance of electricity flowing into the light bulbs. Two of the dancers stood under a cluster of lights hanging from the ceiling in a classic ballroom pose, then things became calmer as classical music started to play. The other three dancers moved along with the couple as they waltzed, fanning out from them as extensions of their movement until they were flung in all directions. Through various sequences and vignettes, the five dancers moved around the space as if discovering their new world, acting in strange ways. For example, one of the male dancers wrapped a piece of clothing around his face and then spent an inordinate amount of time kissing one of the female dancers through the cloth until it was just a mechanical action accompanied by lip smacking sounds. 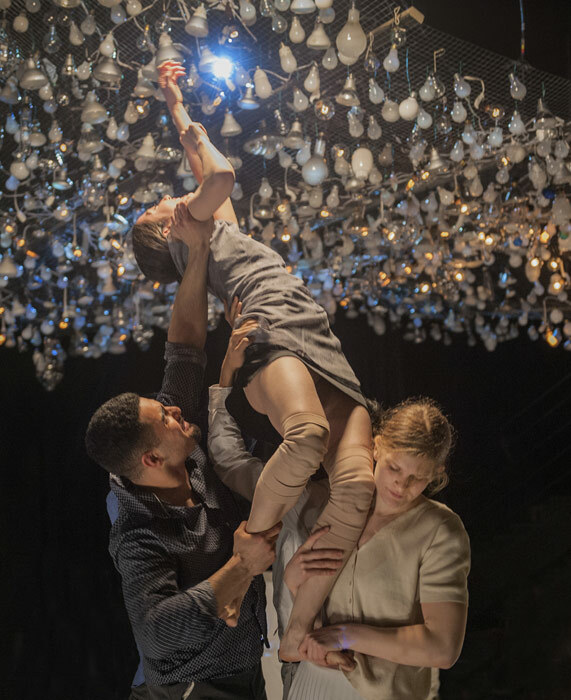 With elements of physical theatre, a contrast between energy and stillness and an intense emotional presence from all of the dancers (Elissa Hanson, Renee Sigouin, Hyoseung Ye, Arash Khakpour, and Diego Romero), Paras Terezakis has created a strange but masterful show to celebrate the 30th anniversary of his company. There were a couple of notable moments: Arash Khakpour had a solo full of stops and starts, moving from the floor to controlled runs and short bursts of energy. Another moment that held our attention was Khakpour holding up another dancer as she reached for a light just out of reach. It was unclear what the intended effect was as stage hands began folding up chairs and encouraging the audience to stand for the last bit of the show. Many were reluctant to give up their seats, and it was a strange way to end an otherwise pleasant experience. After their disordered exploration of their new world, the dancers returned from whence they came — climbing up the ladder as if into a spacecraft that would take them home.